Looking for the best dog statues? 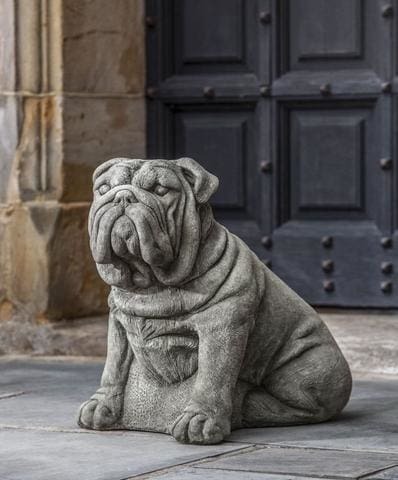 Whether it’s to remind you of an old friend or to add a canine companion to your outdoor space without the daily walks, these dog garden statues will add a playful nature to your outdoor living space. Animal statues also make wonderful gifts for dog lovers and even those who cannot have a pet for a number of reasons. Statuary made from cast stone will ensure that it stays looking beautiful outdoors for years because each piece is designed for continuous outdoor use. Choose from over ten finishes to replicate the look of your furry friend or to create a lasting style to enjoy in your everyday life. The Garden Gates dog statues are hand selected from the finest manufacturer in America, Campania International. Each of the statues is selected for its character and style which lives and breathes as a cast stone dog. Along with the list of dog statues above, there are several very cute statues for the garden. Each of the dogs are made from cast stone and offered in twelve finishes. Each of the finishes take ten to fourteen days to complete the manufacturing process. The patina is apply to the statues need to be completely dry before packaging. Once the dog garden statue is completely dry, our team of packing experts prepare the order for shipment. Once the order leaves our shipping department, our automated system will send the shipping tracking. Tracking our dog statues will be delivered via UPS and FedEx. Buying Dog Statues are a great addition to the home or patio. Our dog statues ship free.